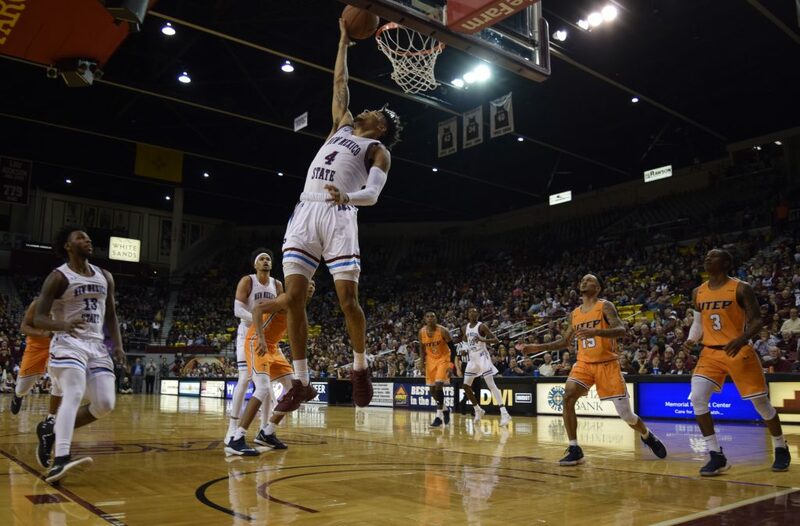 The New Mexico State men’s basketball team outscored the UTEP Miners 96-69 Friday night at the Pan Am Center in front of over 6,000 fans. 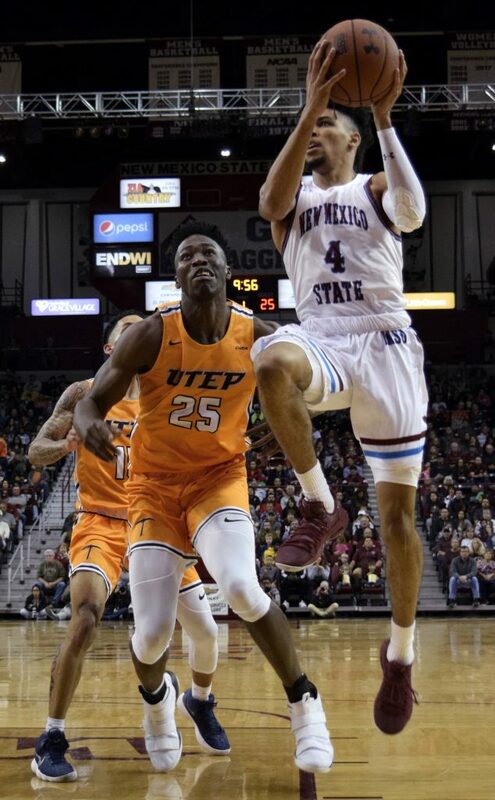 In the classic “Battle of I-10,” NMSU donned retro uniforms. The Aggies came firing out of the gate to begin the matchup with junior Clayton Henry hitting from behind the arc for three. The high-road wouldn’t last long for the Aggies, however. Each team traded jumpers and layups, forcing three lead changes early in the game. 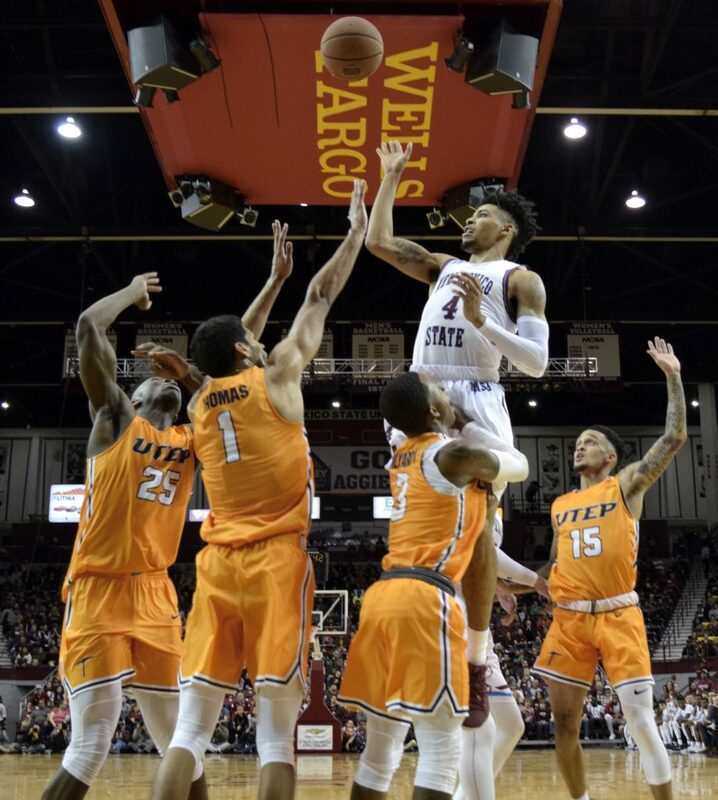 UTEP separated itself from New Mexico State with four 3-pointers, allowing only two layups to increase its lead to nine — the Miners’ largest lead of the game. UTEP held this lead with great defensive efforts and high-percentage shots. At the halfway mark in the first frame, the Aggies started to get into a groove. 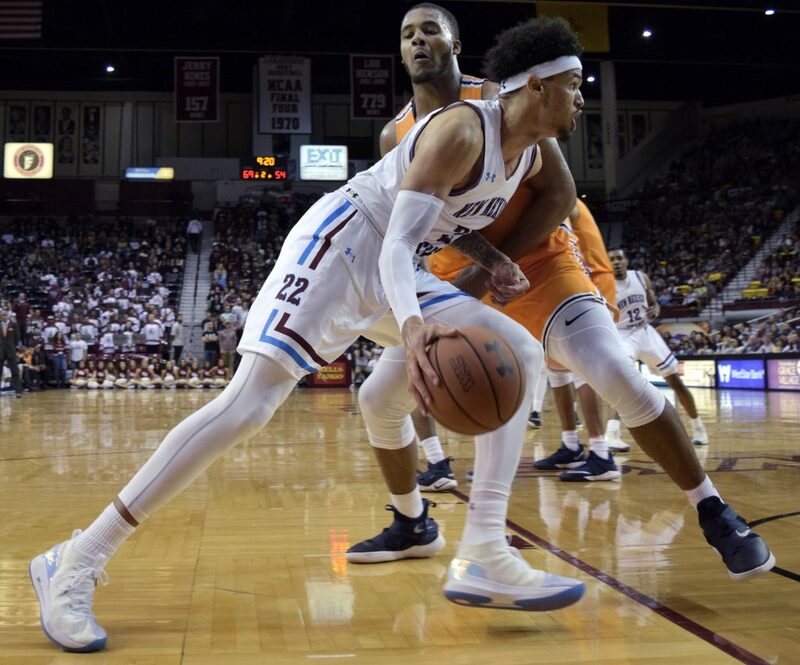 Points were slowly added to the scoreboard, the scoring deficit decreased and New Mexico State rolled on. With just over two minutes left in the half, senior Eli Chuha challenged the Miners defense with a layup; however, Chuha got fouled on his way up to force an “and-one” creating a two-point buffer. 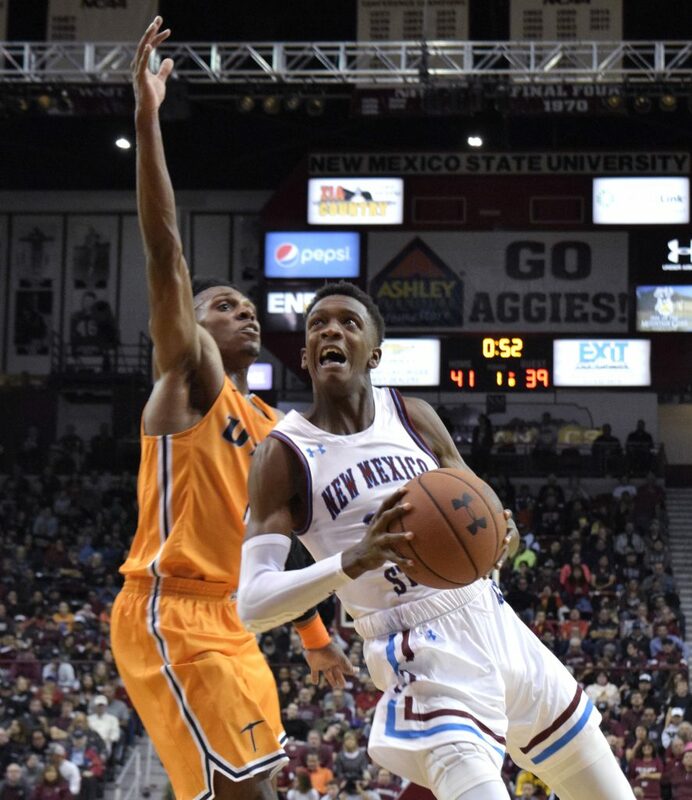 NMSU and UTEP exchanged threes, and Aggie freshman Jabari Rice scored a layup to close the half 43-39. The second half was the opposite of the first. 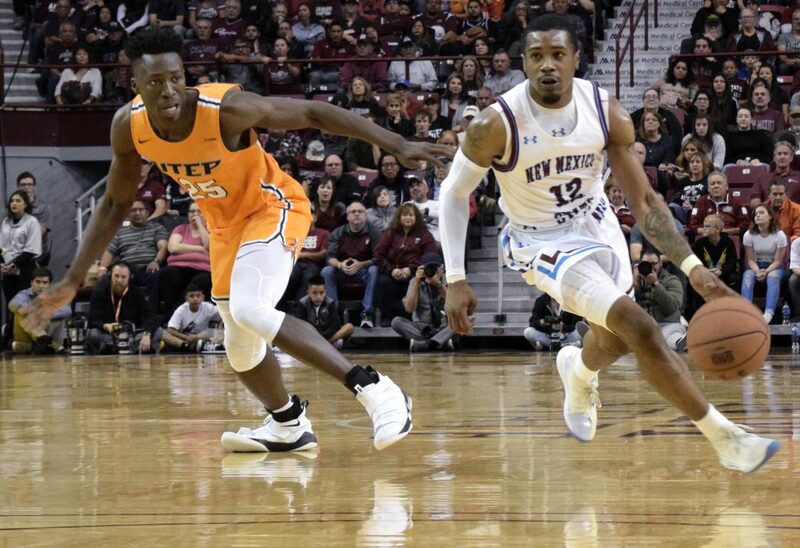 UTEP played inconsistently and made lots of errors, while the Aggies played to their potential. 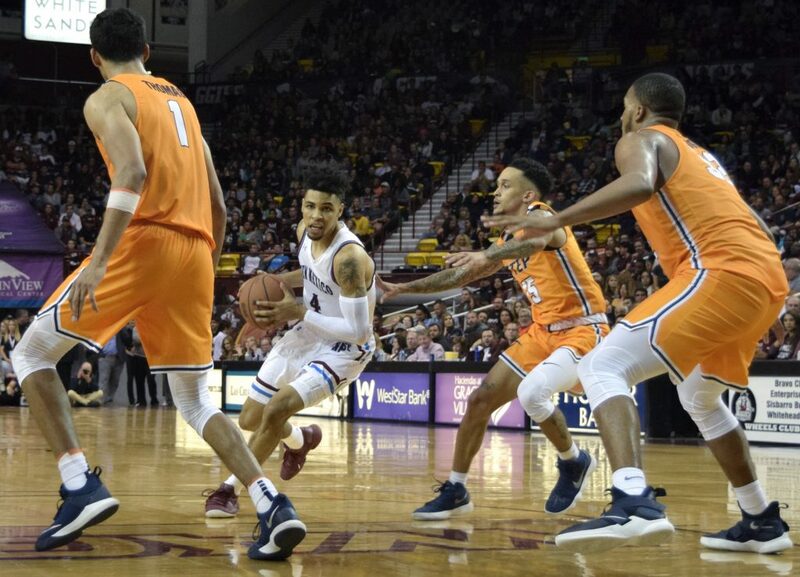 UTEP was the first to shoot, but missed a jumper and created a fast break opportunity for NMSU. 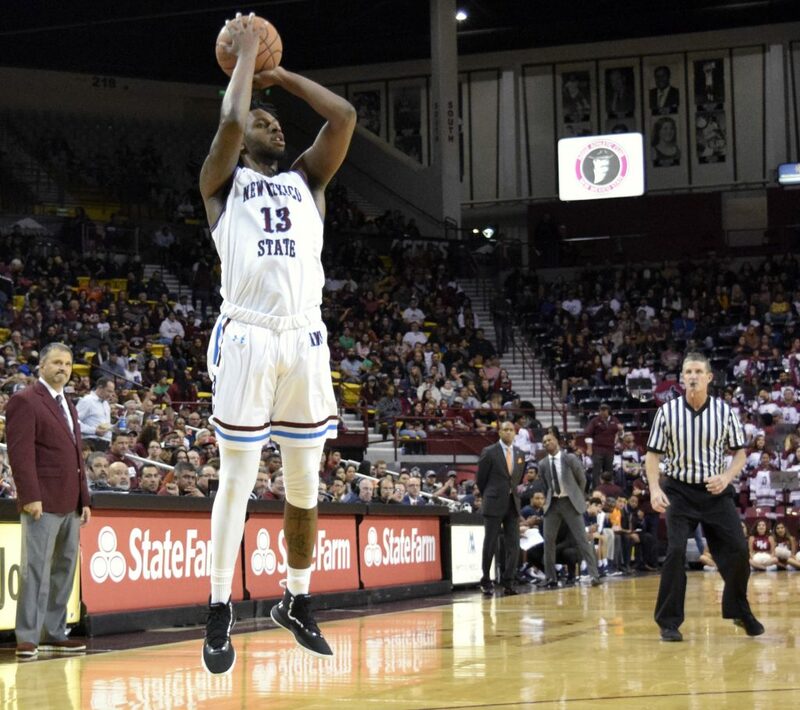 New Mexico State took the opportunity and started the half with a 3-point bomb from junior C.J. Bobbitt. Fouls and missed shots from both sides of the ball halted any scoring for two minutes. 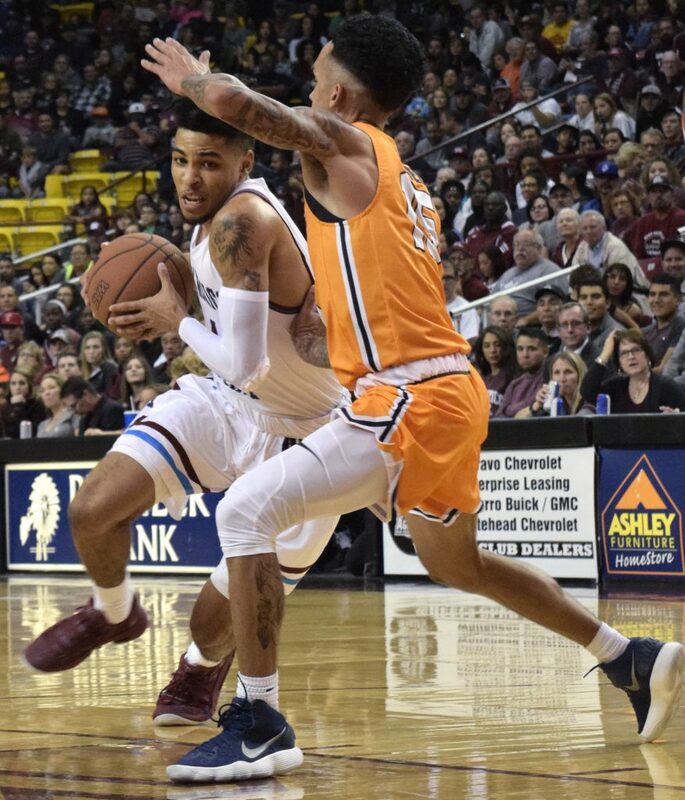 The Aggies and Miners substituted players in and out of the game in search of an outburst. 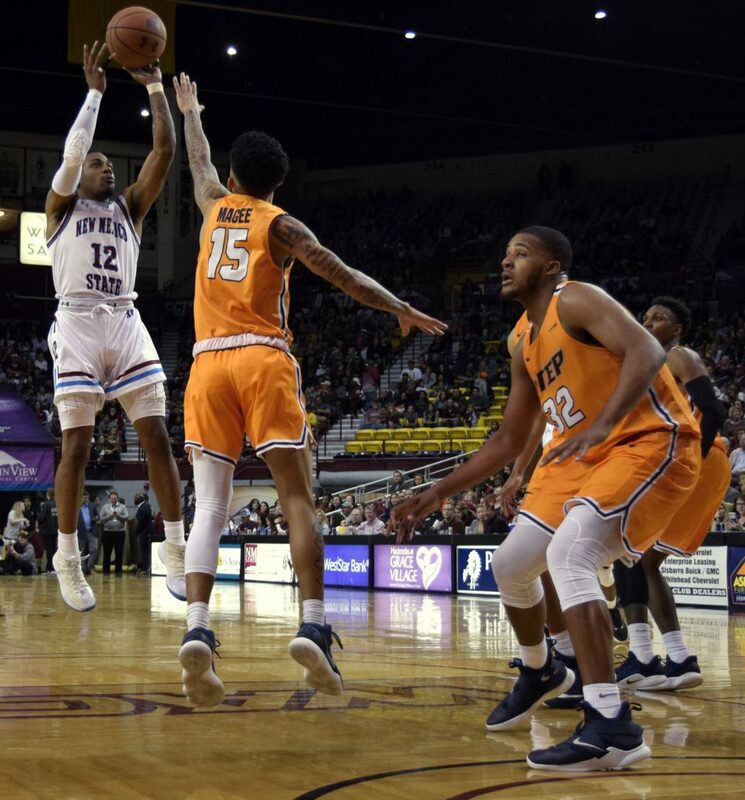 UTEP broke the scoring drought with Kobe Magee finding the bottom of the bucket on an uncontested layup. Within seconds, Aggie C.J. Bobbitt scored a 3-pointer to extend the lead to eight. Five minutes into the second period, the Aggies were ahead 59-45, following an 11-2 run. Foul trouble forced the separation to level out over a span of about 10 minutes. Senior JoJo Zamora extended the Aggies’ lead to 17 with a jump shot with just over five minutes left to play. 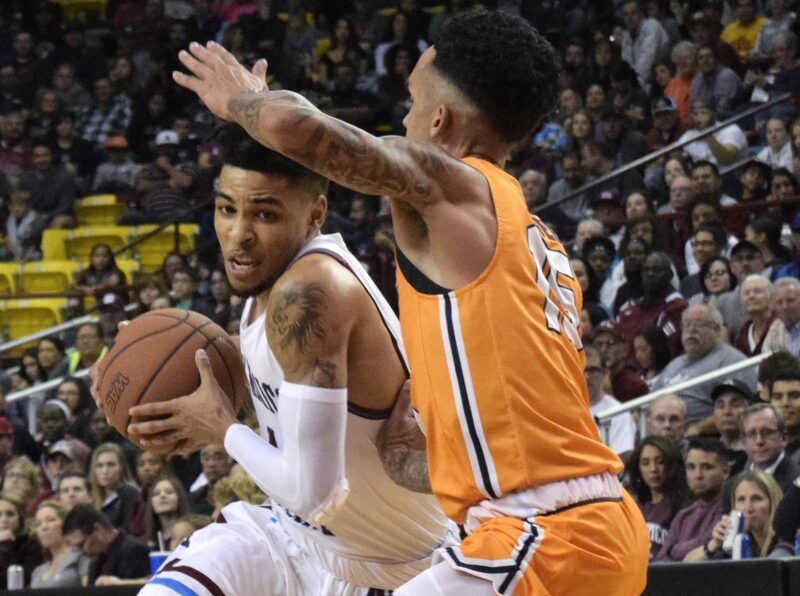 Foul trouble from UTEP late in the game plus high-percentage shots and good defense from NMSU lead the Aggies to a 96-69 victory. NMSU added to its win column and is now sitting at 2-0 on the season. Up next, New Mexico State stays at home to challenge St. Mary’s 2-0 record on Wednesday, Nov. 14. Tipoff will be at 7 p.m.
Great article, and sensational action shots!